In "ORIGIN," we meet a group of troubled passengers as they wake up on a damaged spaceship abandoned in deep space. Each having left behind a dark past in search of a fresh start on a newly colonized planet, they're desperate to survive at all costs. But as their terrifying situation spirals into paranoia, they come to realize that the greatest threat to their dream of starting over - and indeed their lives - might actually be within their midst. The series, which features Tom Felton, will debut on YouTube Premium on November 14. "ORIGIN" is created, written, and executive produced by Mika Watkins. The series is executive produced by Andy Harries, Suzanne Mackie, and Rob Bullock from Left Bank Pictures, alongside Josh Appelbaum, André Nemec, Jeff Pinkner, and Scott Rosenberg from Midnight Radio and Paul W.S. Anderson. 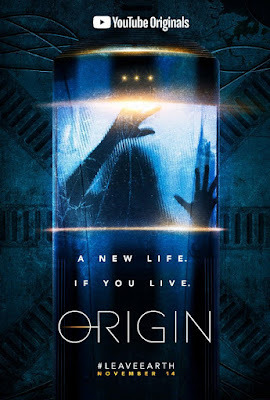 "ORIGIN" is a Left Bank / CiTVC co-production in association with Sony Pictures Television, International Production. Paul W.S. Anderson (Resident Evil: The Final Chapter, AVP: Alien vs. Predator, Event Horizon) directed the first two episodes of this 10-episode series. The cast features an international roster of stars including Tom Felton (Harry Potter Series, Rise of the Planet of the Apes, The Flash) as "Logan" and Natalia Tena (Game of Thrones, Harry Potter and the Deathly Hallows: Part 1 and Part 2) as "Lana", along with newcomer Sen Mitsuji as "Shun." Rounding out the cast of series regulars are Nora Arnezeder, Fraser James, Philipp Christopher, Madalyn Horcher, and Siobhán Cullen. The series also features Adelayo Adedayo, Nina Wadia, Johannes Johannesson, Wil Coban and Tara Fitzgerald. YouTube Premium is a subscription service that offers access to YouTube Original series and movies, a streaming music platform, and an uninterrupted, ad-free experience across all of YouTube. YouTube Premium is currently available in the US, Canada, Mexico, Australia, New Zealand, Korea, UK, Ireland, Germany, Austria, France, Italy, Spain, Sweden, Norway, Finland, Russia, Denmark, Netherlands, Belgium, Luxembourg and Brazil.